The 7th Grade Division at the Tip Off Classic gave us a clear look into the talent of the Class of 2019. Here’s our inside look into this age group. 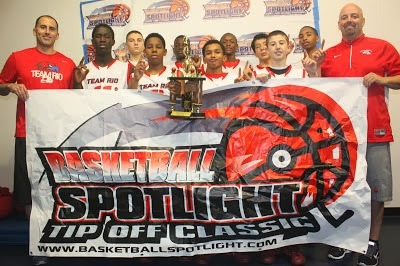 Team RIO National put together some serious talent and showed their true colors at the Tip Off Classic. They cruised through pool play, survived a tough fight with Rens and took home the title in good fashion. When our rankings come out they will be #1 and will then have the huge target on their back. This team has the pieces to do some big time work on the national level. Team RIO has arrived! Team RIO has secured the #1 spot and the next question is who’s #2. Team Takeover has the lead right now but we still have to look at Team Nelson during the MLK Classic. Metro Flyers entered the Tip Off Classic with good acclaim but came up short when they didn’t advance after pool play. As the circuit goes on we will see what team will emerge as that true challenge to RIO.